Call now to know more about Thermage or to get the best price quote. *Get your Thermage treatment done only from a Thermage certified Original Clinic. Look for the Thermage Original Clinic seal of authenticity. 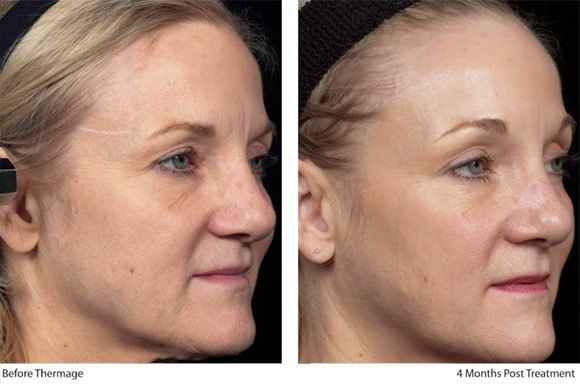 Thermage is a leading non-invasive skin tightening treatment that uses radio-frequency energy to regenerate and remodel collagen through a natural process for a smooth and toned look. Approved by US FDA, Thermage addresses all the concern areas like the face, body, and eyes, without using any syringes or surgical procedures. Chosen by 1 million+ people, the procedure requires a single sitting for a result that lasts for a year or even more. A journey of real life people who transformed their skin and their lives through Thermage. BL/AS/Thermage/ 07.17/01 Marketed By: Bausch & Lomb India Pvt.Ltd., 4th Floor, Tower B, Unitech Business park, South City-I, Gurgaon-122002, Haryana. Information provided here is not to substitute the advice of a trained medical practitioner. Contact doctor for more details.Individual results may vary. MKC2028H © Solta Medical Inc. All rights reserved. Solta Medical & Thermage are registered trademarks of Solta Medical Inc. and its subsidiaries. Disclaimer: Individual Results may vary, and testimonials are not claimed to represent typical results.